Simon Dale proves that you don't have to be an architect to design and build a beautiful, cozy, low-energy home. With £3,000, a few simple tools, and a little help from his father-in-law and friends, Simon constructed an extraordinary hobbit home that has virtually no visual or environmental impact on the surrounding landscape. Using locally-sourced and natural materials taken from the nearby woodlands, a common practice among designers in Wales, alternative energy sources, and a lot of imagination, the self-styled builder has created a gentle, naturally-lit family home that exists in total harmony with nature. 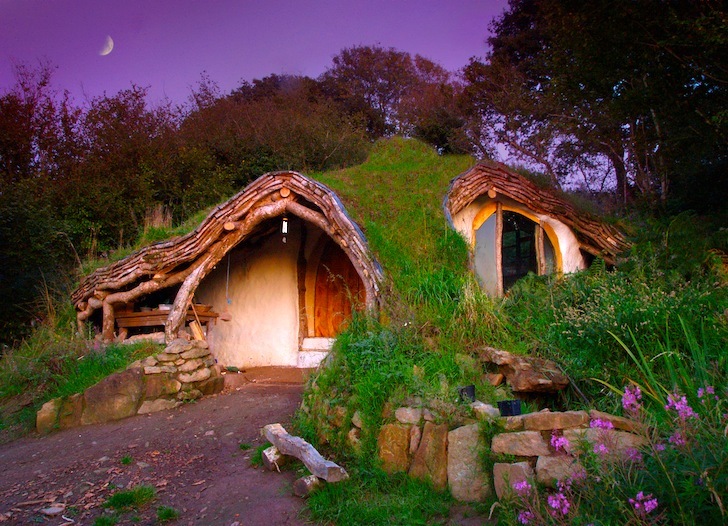 We’ve noticed a surge in hobbit homes as more people throughout the world seek alternatives to the bigger is better model of living. For example, in Switzerland, one family buried their home but opted for more luxurious finishings instead of turning to natural materials as the Dale family has done. 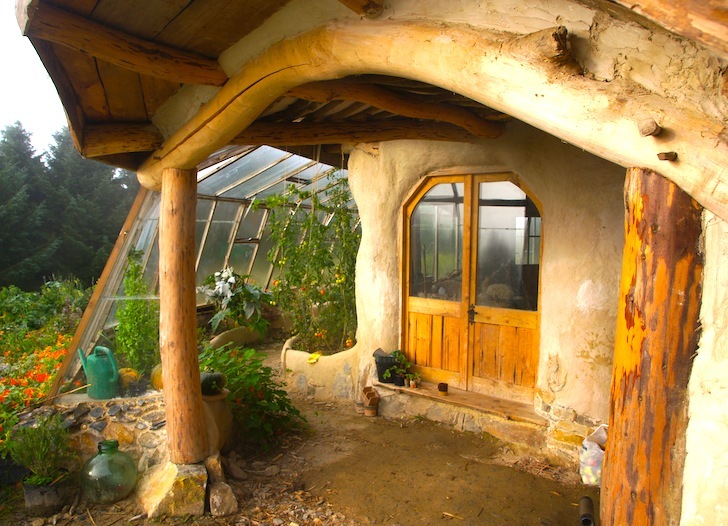 The hobbit house’s framing consists of locally-gathered oak thinnings, the retaining walls and foundations were made from stone and mud, and straw bales were used to insulate the floor, walls, and roof. The interior walls were finished off with breathable lime plaster which has a much lower embodied-energy footprint than cement, while all of the flooring, finishings, windows, plumbing – virtually everything inside – was re-purposed from discarded scrap materials. A wood burner heats the home, and an ingenious system that pipes cool air in from underground keeps the family refrigerator at an optimum temperature. A skylight fills the small home with natural light, water is sourced from a nearby spring, and solar panels provide all of the electricity the Dales need to power their musical, computing and lighting equipment. For people who lack both formal qualifications and stacks of cash, this amazing hobbit house puts the dream of living in an earth-friendly home firmly in reach. I would like to build a little tiny hobbit structure on my property which can be used for extra bedroom and guest quarters. Any suggestions? Lovely my dream home. Love to live of the grid, cant find anywhere in UK. i love this - and i had an acre of land at one time. I just love it. yeh, but we could do alot of work ourselves though.. I absolutely love it. It looks like home to me. Where can I get the plans and design. I WANT ONE! I love this home with all it's eco friendly charm, but I had one concern when viewing the photos...Image 6 looks like a live tree is supporting the roof and is the central grounding for the home; so what happens to the structure when the tree grows? I love the concept, but I had to ask this. Oh...and there was no mention of removing human waste...Is this on septic system? Love it would like to copy in Calalan. As for the south of spain , thay more or less have them , in the form of caves cut into yhe soft sandstone. In Granada there is a large amount of habitated caves. South Spain is riddled with them many ex-military. Incredible. I wonder how long it took to build? How many friends? For so little money I'm guessing it must of been a lot of friends or a very long time. Incredible. Question is how long did this take to build? It says a little help from father in law and friends. How many friends? $4500 US cant even buy you a house in Vegas where you can throw a rock and hit 3 foreclosed houses. While this style of off-the grid, living with nature, style of building may not be ideal for full time living (for people adjusted to urban/suburban environments and their percieved or actual conveniences), I see this type of living option perfect for vacation/second home living. Resort cities and towns that are getaways might seriously consider providing housing choices that have a smaller footprint in order to become more sustainable. I do see that it would be difficult though, at least here in California, due to strict building codes. But I wonder if resorts that rely on large second home residents for their economy could lobby for alternative choices. I think everyone will love the romantic concept but very few authorities would allow it. If the UK population were about 1 million instead of 60 million I suppose everyone could have a house like this. Anyway, where does he park his car/s? What does he do for a living? what would a home like this look like when built in the south of Spain with hot summers? Absoltely loving this living place- I'd move in! ross quinn, what are you on about? I appeared at the planning hearing where they got planning consent. nugget. From someone who is living in london paying crippling rent, this house looks very inspiring and attainable. @ LaraLee, I think the author was referring to the fact that it's a common practice for many Welsh designers to use natural and/or locally-sourced materials in their architecture, not that the hobbit homes themselves were commonplace- although that would definitely be an interesting neighborhood! @ LaraLee, I think the author was referring to the fact that it's common practice for Welsh designers to use natural and/or locally sourced materials in their designs, not that the hobbit homes themselves were commonplace- although that would definitely be a fun neighborhood. This home is adorable. Being 'common' , as said early in the article "a common practice among designers in Wales", where are these homes to be found please? What Shire, suburb, town, etc? The bedroom is the maisonette floor up the stairs. I want a house like this. It makes so much more sense than paying rent every month!!!!! This house probably exceeds all regulations for structure, health, and codes. Why does someone need a bedroom to sleep in??? Why can someone not sleep on the floor, couch, table, etc.??? I think this a great house, concept, and construction. If this £3,000 is true/correct then it is an amazing idea for a vacation home or cottage! This is an absolutely adorable home. It is so warm and cozy and I love that it was built into the environment in such a way that it doesn't take away from its surroundings. I am just confused about one thing, where do these people sleep? I saw no bedrooms or sign of any place to lay your head! hey, can you live in this house officially, i mean is it conform with all regulations..? With just a few simple tools and £3,000 Simon and his father-in-law built this hobbit house in just four months. Straw bales in the roof, walls and floor provide further insulation. Even in cold weather, thanks to the earth's natural thermal massing and insulation, the hobbit house stays warm!